PULSONIC has developed 3-cup anemometer to integrate it into their Automatic Weather Stations, into a display or a programmable controller. PULSONIC designed wind sensor for more than two decades. 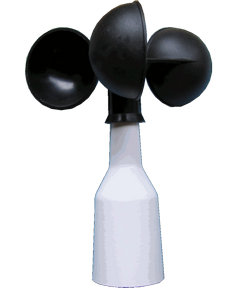 Our R&D team designed this 3-cup anemometer to provide a solution to monitor the wind speed with high accuracy and long life expectancy. This sensor can be installed stand alone with a 4-20 mA output (Alizia 178), it can integrate into a complete wind system (Alizia 312) or in Automatic Weather Station (Alizia 150). The 3-cup anemometre using water tight and long lasting bearing wheel to increase the life span of the sensor. The cup is made of polyamid material which is designed to resist to sun and UV even in the most difficult places in the world. The body is made of cast alumunium that provide one of the most robust solution. 0-60 m/s wind speed measurement, very low starting threshold.